This blog is a guest post from Leslie Constans, who works in Regence's Strategic Communications department. Leslie participated as a relay team member in the innaugural Hood to Coast Washington 2017 and shares her reflections on the race, the local communities, and the teamwork that the race inspired. In business, high-performing teams work together to deliver on the company’s promise to customers. In sports, the idea is the same, where people with different strengths build on each other to get to the end line. So what happens when you take team members from business functions like Operations, Sales, Marketing, Program Management and Communications and throw them into a van for a 77-mile, 12-hour relay race starting at 3:30 in the morning? 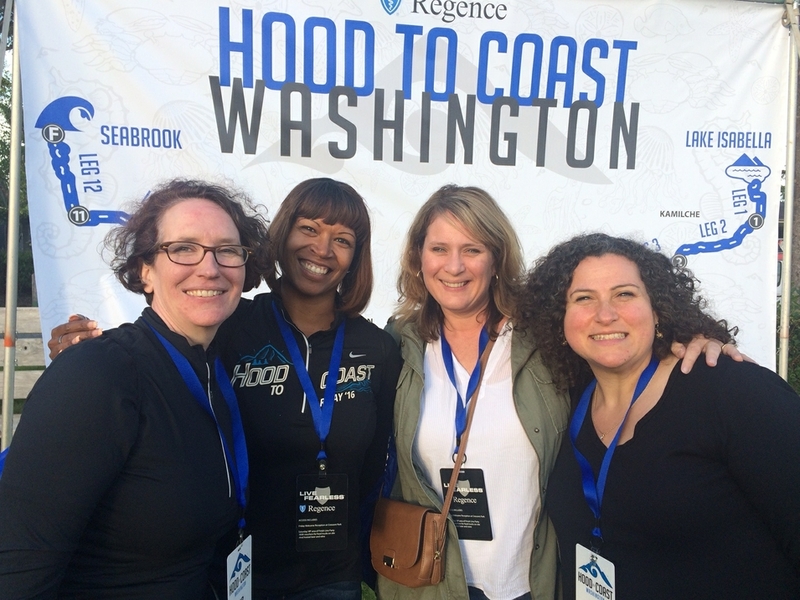 At Regence BlueShield, you get one of the four Team Regence groups that walked (or ran) the inaugural Hood to Coast Washington race June 3-4, 2017, a take on the famous Oregon event that started 35 years ago. You also get a high-performing, passionate and extremely fun group of people who proved that teamwork—and our company values—extend beyond the office. As the title sponsor of the first-ever Hood to Coast Washington, Regence BlueShield got involved to further demonstrate its commitment to the community.What better place to do that than near the birthplace of the company 100 years ago in Pierce County, Washington? The race had an estimated economic impact of between 1 and 1.5 million dollars on the communities in the region. I was a member of the company’s only walking team, the Legendary Walkers. While many of us had never worked together before, we bonded on the four-hour ride to Seabrook (sharing snacks and belting out a tune or two) and quickly bonded as a team walking our way relay-style to the Pacific Ocean. After the long ride to our destination, we enjoyed dinner and birthday cake to celebrate Regence BlueShield’s June 2nd Centennial. Most of the runners we shared a house with went to bed—a smart move considering our 1:00 am wakeup call to drive the one-and-a-half back to the beginning of the race. The inaugural 2017 Hood to Coast Washington course started near Lake Isabella State Park for the runners, winding its way through the Olympic National Forest, along the Chehalis River and Grays Harbor, and eventually ending at the state’s best kept secret—the coastal community of Seabrook, located on the Pacific Ocean. For the walkers, our relay began in the town of Elma, Washington, in a school parking lot. The average walking leg was a little over 6 miles, and teammate Doug and I volunteered to walk the first two and last two legs for our team. Doug kicked us off at 3:30 am in the dark—well-illuminated with the required headlamps and reflectors and setting a brisk pace. I took the second leg at 5:00 am, crossing the Chehalis river and passing small sawmills as the sun came up. I psyched myself up to “catch the flag”—literally a guy carrying an American flag who had started quite a ways in front of me—but couldn’t quite reach him before we ended and he passed his flag on. Nancy, a former runner, powered through the third leg of woods and rivers; Nicole jammed through the town of Abdereen, inspiration for Kurt Cobain’s “Come as You Are” Nirvana ballad, and crossed two suspension bridges in the early morning light; Stephanie climbed several challenging hills on the way to the coast; Dee flew through the now-emerging sunshine of the early afternoon. Finally, Doug and I walked the final two legs along the hilly, forested road to Seabrook. Twelve hours after our start, the Legendary Walkers crossed the finish line in style. After a fun evening celebration in the coastal town of Seabrook, we jammed to 80s music and swapped race stories with the other Regence teams. The next morning, we had a leisurely team breakfast with our team captain Janet and for the first time the entire weekend, we shared how and why each of us came to work at Regence, further solidifying the bonds we had just forged on our relay. Hope: from the moment we started driving to the start line in the middle of the night, the Legendary Walkers were optimistic and hopeful about the challenge ahead and our ability to complete the relay, even though some had injuries and others had significant miles ahead. Courage: we helped our drivers navigate crazy turns in a huge van no one had ever driven before and avoided getting it stuck in the grassy fields that were turned into parking lots. Empathy: everyone had each other’s back, making sure fellow walkers got hugs and high fives, food, drinks and sleep during the 12-hour trek. Trust: we each walked, knowing the team would be waiting at the exchange or along a hill or tough patch on the road. When a light went out, a backpack got too heavy, or a drink was needed, we were there. Commitment: I can’t count the number of times someone said, “You got this!” or “There’s our girl.” As I walked the last 6-mile leg, my team told me they’d meet me at the finish line and cross together. Collaboration: each team member raised their hand to walk one or two legs of the race and supported each other when it wasn’t their turn. Innovation: we shared our knowledge of technology to stay connected to each other – creating a “Legendary Walkers” group text and location-based tracking, sharing photos and messages of encouragement, and posting parts of the relay on Twitter and Snapchat. Accountability: we made sure our early-morning walkers had the right lights and enough food; we stopped on the hills and waited for the ones climbing uphill to offer a drink or power bar. I think I can speak for the others when I say, we left Hood to Coast Washington with new friendships, an appreciation for each other’s unique contributions and most importantly a sense of the power of being a part of a team that can do anything together, either outside or inside of work. Want to learn more about Hood to Coast Washington? Read "Making positive strides in our community" by Regional Market Vice President Andrew Over or watch event highlights on our YouTube channel.